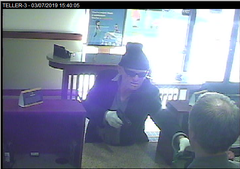 The Newport Beach Police Department is seeking the public’s assistance in identifying a suspect in a bank robbery investigation. 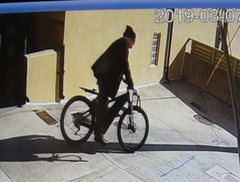 The crime occurred on March 7, 2019 at 3:48 p.m. at OneWest Bank (3700 East Coast Highway). 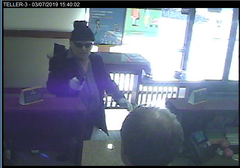 The suspect entered the bank and brandished a black semi­automatic handgun as he demanded money from the teller. There were no customers in the bank at the time and no report of any injuries. The bank reported a loss of $8,000. OneWest Bank security cameras captured the attached photos at the time of the robbery. The suspect may have stuffed a pillow inside his shirt to display a different body characteristic. 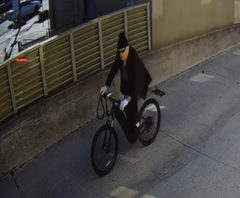 After committing the robbery, the suspect fled from the location on a black electric bicycle. The suspect is armed and dangerous; do not approach him if located. Anyone with information regarding the identity of the suspect in the photo is encouraged to contact Detective Mike Fletcher at 949-644-3779.